Much of my day is spent talking with people on the phone who have expressed interest in learning more about the Shipping Solutions export documentation and compliance software. The ones who become customers tend to have many of the same reasons for investing in the software. 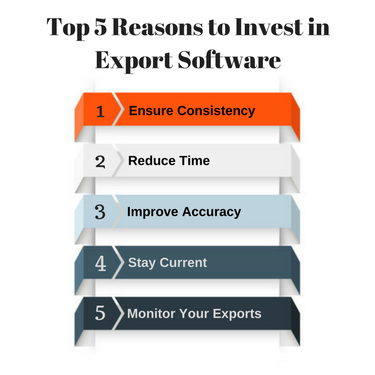 This article outlines the five most common reasons why companies invest in and use export software. If you’re on the fence trying to determine whether or not export software is a worthwhile investment, take a look at the information below. I hope it will help guide you towards making a well-informed decision. Exporting companies that do not have an export documentation and compliance software in place often have a rather haphazard procedure for creating their export documents. They may use Word or Excel templates, which entails typing the same data over and over and doing a lot of copying and pasting. These processes are time-consuming and tedious. I recently spoke with a company that used an accounting software to create their packing lists, another software to produce bills of lading, and yet another software to create commercial invoices. They used templates found online for other documents like certificates of origin, and they relied on their freight forwarders to supply shipper’s letters of instruction, which they then filled out by hand. Using three different software programs and having several sources for their other export documents makes for a rather disorganized, inconsistent and potentially unreliable process. Download a free trial of Shipping Solutions. Imagine instead that you have one software program to produce all of your export paperwork and the database is shared across multiple workstations, so employees can easily view and edit the export documents prepared by other employees if needed. With the click of a button, you can pull in your contact and product information for each shipment from a database, and this information will be automatically added to all the documents for which it is needed with the proper formatting. You simply enter the information once, and you’re good to go. This is the reality for Shipping Solutions users, and this ability to centralize export documentation procedures and make the overall process more consistent is the single biggest reason why companies end up buying export software. Having one system for all your standard export paperwork will cut down on the time it takes to create the documents. Our customers say they can produce their documents up to five-times faster than traditional methods like using templates. They’re able to achieve this because software like Shipping Solutions is specifically designed to eliminate redundant data entry. Software allows you to enter information common to multiple documents on a single screen, rather than having to retype the same information over and over again for each document. Manual data-entry methods like utilizing Word or Excel templates are prone to errors. The more typing you do, the greater the chance of making a typo. These mistakes can hold up your shipment, prevent you from getting paid on time, or get you in trouble with customs. Automating your export procedures by using export software significantly cuts down the amount of typing you need to do, resulting in less errors and, in turn, less headaches for you and your customers. Export regulations are constantly changing. The data required on export paperwork, product classification codes (such as HS codes or ECCNs), and industry best practices are in a constant state of flux. It can be a challenge to try and keep up-to-date on the changing regulatory environment. Fortunately, software can help in this regard. Software like Shipping Solutions is consistently updated to reflect changing regulations and evolving best practices. When you use Shipping Solutions, you can be confident that you are using only the most up-to-date information. Shipping Solutions includes a Shipment Log that acts as a checklist your users can follow for each shipment. The steps in the checklist can be customized to fit your company’s specific export compliance procedures. That way you can document that each step is being followed, and you can monitor who did what for each shipment. Shipping Solutions’ built-in Export Compliance Module allows you to run compliance screenings to make sure you are not doing business with a person or company on any of the government’s restricted party lists, to make sure you know which documents you need to provide for each shipment, and to make sure you are aware if an export license is needed. Furthermore, the results of any of the screenings you run in the Export Compliance Module can be printed and are stored in an audit trail. Shipping Solutions also includes the ability to generate reports such as shipments by country, by products, or by freight forwarders in a given date range. You can utilize these reports to keep an eye on key data elements and decipher overall trends in your export transactions. I'd be happy to show you how Shipping Solutions can help your company create accurate and consistent export forms. Click here to schedule a free online demo of the software. Or see how other export companies have benefited from Shipping Solutions. Check out a variety of case studies of Shipping Solutions users.